The supply depot is right there at the first Nav point. Take out the fighters, then start work on the base. The base is covered in turrets and they're awkward to take out too. The best way to take it out is probably to fly a Thunderbolt and concentrate fire on one spot before launching your torpedo. After taking out the supply depot, you only have the last two Nav points to go. They don't contain anything special so take them out and go home. You'll be back on the winning path in no time. Success go to Torgo 1. Failure go to Delius 2. 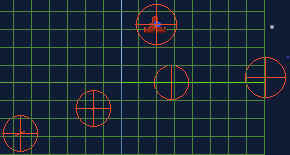 Although your objective is to defend the jump point, you'll face fighters at two Nav points before you even get there. Try to save your missiles for the big fight at Nav 3. Also try not to take any damage so keep an eye on the Corvette's rear turret. At Nav 3, take out the Destroyer first. The other waves will arrive as soon as all fighters in the area are destroyed so taking out the Destroyer before the waves arrive will leave you one less thing to worry about. That also goes for the corvette in the second wave. However keep an eye on the fighters in case one tries to shove a missile up your tail pipe. Success go to Delius 3. Since you didn't successfully take out the supply depot in the first mission in this system, you get to have another crack at it. This time the Victory is along for the ride, although it won't actually help you. You can only choose to fly either an Arrow or a Hellcat. I suggest you take an Arrow since it has autoslide. When tackling the supply depot, you can keep autosliding past it with guns blazing. Turrets have trouble hitting you when you're autosliding past. Since you shouldn't really have to use any missiles on the three fighter waves, you can expend your missiles on the base too. Comments : Oh, the Victory Helps you alright. It'll Fire Missiles at the Depot, it only takes one to take it down, too. Very Quick mission. Comments : The cutscene with Flint shouldn't be on this mission, the screen on the display that she is looking at is showing the Caliban system (the system you go on the winning path), if you go to the Delius System you miss out on the Caliban system entirely. The Kilrathi cutscenes are also different.